Biohazard cleanup can be a difficult job in the best of circumstances. 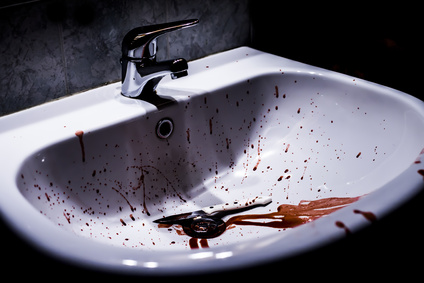 Whether the situation involves a serious personal injury or even a death, anyone involved in cleaning up a blood spill must be aware of the safety issues. They must also be sensitive to the feelings of the survivors. Professional crime scene cleaners are not only acquainted with the technology and methods best suited to trauma cleaning; they are experienced professionals who conduct their work with compassion and caring for those affected by the tragedy. Today, more people are conscious of the safety issues surrounding the handling of blood and other bodily fluids. Those who work in industries that deal with blood on a daily basis take special precautions to prevent exposure. This may involve wearing specially designed masks, gloves, and other protective gear, as well as following local and federal guidelines for safe management of hazardous materials. Professionals who are at additional risk of exposure include dentists, blood donor technicians, and lab service workers. Companies that attempt their own blood cleanup can face potentially serious consequences if the scene is not remediated properly. Government agencies can assess hefty fines against those that perform an improper cleanup or dispose of biohazardous materials in an improper manner. In addition, if an unqualified employee who has performed a cleanup contracts a serious illness, the company may be held liable. In addition to physical health concerns, the presence of blood has a profound effect on human emotions. Following a workplace accident, any remaining stains may serve to remind co-workers of the traumatic event. Smart employers may manage feelings of vulnerability in employees by offering counseling, critical incident stress debriefings and other mental health services. A thorough cleanup of the accident site can also go a long way toward reestablishing a sense of normalcy and reassure employees that their well-being is a matter of concern. We at CSCU know that a cleanup job is more than a cleaning job. We understand that cleaning the accident site in a haphazard or disrespectful manner can further complicate an already traumatic situation. Our technicians are aware of the importance of their work, and perform every task with respect and compassion. We want to make your cleanup process as painless for you as possible. Our goal is to leave the site safe and sanitized, as if the accident never happened. We will work with your insurance representative to make the process as transparent to you as possible. If you require our services, call us today and let us make the arrangements.